Dissolve Salts in Water to Make Rooting Solutions. Use by Foliar and Basal Methods on Plants That Can Be Propagated from Cuttings. Use on Annual, Perennial, and Woody Ornamental Plant Cuttings. Use Hortus IBA Water Soluble Salts (20%) to make rooting solutions. 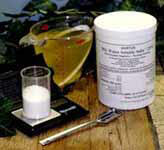 The Salts dissolve easily in water to over 100,000 ppm IBA. Use the solutions to propagate new plants from cuttings. Treated cuttings are expected to produce uniform roots all around the basal end. Causes moderate eye irritation. Harmful if inhaled or absorbed through the skin. Avoid contact with eyes, skin, ingestion or inhalation. Avoid breathing dust (vapor or spray mist). Wash thoroughly with soap and water after handling. Remove contaminated clothing and wash before reuse. Applicators and other handlers must wear: long sleeve shirt, long pants, shoes, socks and waterproof gloves. For exposure in enclosed areas or outdoors, use a dust/mist filtering respirator (MSHA/NIOSH approval number prefix TC-21C, or a NIOSH approved respirator with any N, R, P or HE filter) when mixing solutions, or when spraying solutions on cuttings by the Spray Drip Down® Method. When treating cuttings by the Quick Dip, Long Soak and Total Immerse Methods, use of a filtering respirator is not required. No PPE is required after cuttings are inserted into media. Users should: Wash hands before eating, drinking, chewing gum, using tobacco or using the toilet. Remove clothing/PPE immediately if pesticide gets inside. Then wash thoroughly and put on clean clothing. Remove PPE immediately after handling this product. Wash the outside of gloves before removing. As soon as possible, wash thoroughly and change into clean clothing. > Do not induce vomiting unless told to do so by the poison control center or doctor. > Do not give anything by mouth to an unconscious person. For terrestrial uses: Do not apply directly to water, or to areas where surface water is present or to intertidal areas below the mean high water mark. Do not contaminate water by cleaning of equipment or disposal of equipment wash waters or rinsate. It is a violation of Federal law to use this product in a manner inconsistent with labeling. For any requirements specific to your State or Tribe, consult the State or Tribal agency responsible for pesticide regulation. Use this product in accordance with its labeling and with the Worker Protection Standard, 40 CFR 170. This Standard contains requirements for the protection of agricultural workers on farms, forests nurseries, and greenhouses, and handlers of agricultural pesticides. It contains requirements for training, decontamination, notification, and emergency assistance. It also contains specific instructions and exceptions pertaining to the statements on this labeling about personal protective equipment and restricted-entry intervals. The requirements in this box only apply to the uses of this product that are covered by the Workers Protection Standard (WPS). Do not apply this product in a way that will contact workers or other persons, either directly or through drift. Only protected handlers may be in the area during application. THE RESTRICTED-ENTRY INTERVAL (REI) FOR THIS PRODUCT IS “0" HOURS. A wide solution rate range is indicated for this product. Your ideal rates will vary according to specific plant variety, season, quality of the cuttings, and local growing conditions. Prior to large scale production, test a few plants at several rates within the range. If foliar application causes phytotoxicity, try basal applications and/or decrease rates. Use the lowest rate to produce the desired effect. 1) Weigh the required amount of Hortus IBA Water Soluble Salts. Measure by weight not volume. 2) Use tap water at about 65-90F; measure less then the final volume. 3) Mix: dissolve Hortus IBA Water Soluble Salts in the water. • If precipitation occurs with tap water then dissolve in distilled, demineralized, or filtered water. • Do not dissolve Hortus IBA Water Soluble Salts in solvents other than water. 4) Add water to the mixing container to bring the solution to the final volume. 5) Apply the solution by the selected method. 6) After use, dispose of the solution as described in the ‘Storage and Disposal’ statements on this label. • For the Total Immerse and basal methods, dispose of solutions between plant lots to avoid cross contamination. • Stock solutions can be made in any concentration, to over 100,000 ppm IBA, using Hortus IBA Water Soluble Salts mixed in water. • Hortus IBA Water Soluble Salts contain 20% IBA. Use to propagate new plants from cutting, from those easy to root to the most difficult to root. • Take plant cuttings, usually stem cuttings. • For woody cuttings usually wound by making a 3/4" long notch at basal end. • Take care of cuttings as appropriate for the plant variety. Control watering, temperature, humidity, light and other environmental factors. Observe and control external factors such as insects and fungus. • Use the minimum concentration to achieve results; excess concentration may inhibit root formation. Use on cuttings in the growing season and winter dormant cuttings. • Immerse basal end of cuttings approximately 1" in solution for 12 to 48 hours. • Stick immediately or store. • Immerse basal end of cuttings approximately 1" in solution a few seconds. • Total immerse the cuttings in the solution for about 5 seconds. A basket is useful. • Spray the solution on leaves and stems until the solution drips down into media. Use on rooted plants and leafy plant cuttings in the growing season to develop uniform crops, when propagating plants from cuttings after sticking by any method, or when transplanting. • Method: Spray Drip Down® Method: Spray the solution onto the leaves of plants until the solution drips down. • Rates: Use the Spray Drip Down® Method trial rates listed above. Use the lowest concentration to produce the desired effect. • Frequency: Weekly or until the required results are achieved. • Trials: Do small trials prior to doing large scale production. Store in a cool dry place under lock and key. Post as a pesticide area. Always store pesticides in the original container. Store away from food, pet food, feed, seed, fertilizers, and veterinary supplies. Place liquid formulations on lower shelves and dry formulations above. To avoid wastes, use all material in this container by application according to label directions. If wastes cannot be avoided, offer remaining product to a waste disposal facility or pesticide disposal program (often such programs are run by state or local governments or by industry). Nonrefillable container. Do not reuse or refill this container. Triple rinse as follows: Empty the remaining contents into application equipment or a mix tank. Fill the container ¼ full with water and recap. Shake for 10 seconds. Pour rinsate into application equipment or a mix tank or store rinsate for later use or disposal. Drain for 10 seconds after the flow begins to drip. Repeat this procedure two more times. Then offer for recycling if available, or puncture and dispose of in s sanitary landfill or by incineration. Do not burn unless allowed by state and local ordinances. It is warranted that this product conforms to the chemical description on the label thereof and is reasonably fit for purposes stated on such label only when used in accordance with the directions under normal use conditions. It is impossible to eliminate all risks inherently associated with the use of this product. Crop injury, ineffectiveness or other unintended consequences may result because of such factors as weather conditions, presence of other materials, or the manner of application all of which is beyond the control of Rhizopon b.v. or Hortus USA Corp. To the extent consistent with applicable law, Rhizopon or Hortus USA shall not be liable for consequential, special or indirect damages resulting from the use or handling of this product. To the extent consistent with applicable law, all risks shall be assumed by the buyer. Rhizopon or Hortus USA make no warranties of merchantability or fitness for a particular purpose nor other express or implied warranty except as stated above.